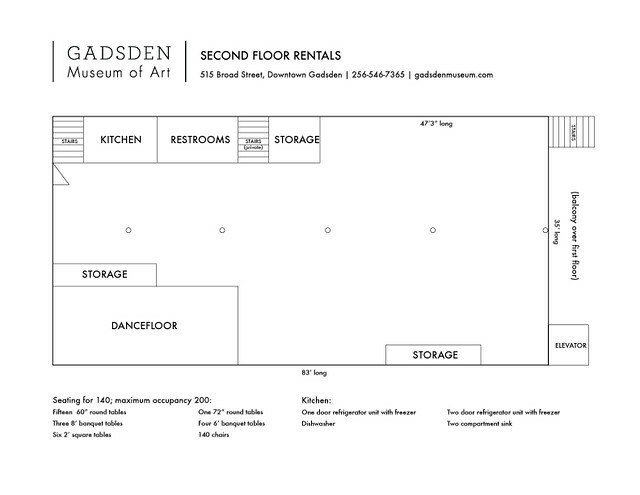 The Museum’s second floor is available to rent for meetings and special events. There is seating for 140 and a maximum occupancy of 180. There are two sets of restrooms (one on the first floor and one on the second), an elevator, dance floor and small kitchen. The kitchen has two refrigerators, a sink, stove, microwave and dishwasher. *Note: If alcohol will be present, an off-duty Gadsden City police officer must be present for the event. The officer must be paid $25/hr (for a minimum of three hours). Use of the second floor, kitchen and restrooms. Early access to prep and set up, prior to the function. Museum carts and elevator for easy access to rental space. The GMA kitchen is to be used for holding and heating of off-site prepared foods. *While we strive for excellent customer service, the facility is a museum and the responsibility to protect the artifacts and art is our first concern. At no time will artwork be moved; all installations or shows are to remain intact.